River City Sculptures on Parade is a non-profit group with a vision to bring a significant display of public art to Mason City. We are in a partnership with SculptureOne which also has similar sculpture programs in Sioux Falls, SD, Mankato, MN, Eau Claire, WI and Castlegar, British Columbia. We have exclusive rights to the SculptureOne presence in the state of Iowa. River City Sculptures on Parade is a 1.7 mile walk designed to lead participants on a looping route to the Cultural Crescent and back to the central core of Mason City. The sculptures are owned by the artists and loaned to the exhibit for one year. The public is invited and encouraged to vote for their favorite sculpture from June to September, and the sculpture receiving the most votes is honored with the “People’s Choice Award”. 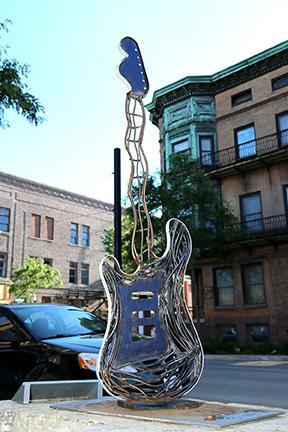 This sculpture is purchased by the city to become part of it's permanent collection. Did you know you can buy or lease a sculpture for your home or business? Art from some of the greatest sculptors in the world are represented in this display. These pieces add a touch of creativity and sophistication that can enhance your property including office space, gardens, retail areas and more. 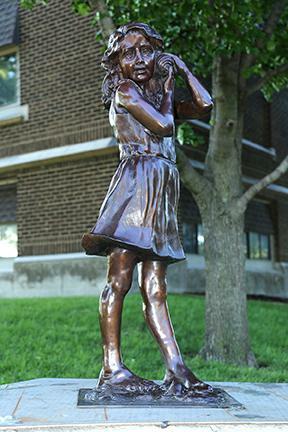 If you are interested in leasing or purchasing one or more of the sculptures, please contact River City Sculptures on Parade at 641-423-5724.